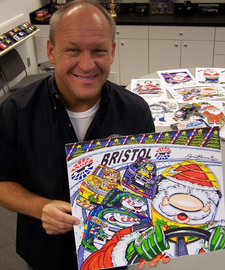 Sam Bass is a motorsports artist, who is best known for being the first officially licensed NASCAR artist in 1997. Bass has had his paint schemes on many different racers cars since he began working with NASCAR in the 1980's. He was commisioned to do the cover art for the 1985 Coca-Cola 600, and has since done the cover for every Charlotte Motor Speedway race. His success in motorsport art led to his induction into the Diecast Hall of Fame Class of 2012 when he was awarded an Automotive Legends title.